Why should you include YouTube in your online marketing strategy? It’s not just because YouTube is the world’s largest video sharing community. In this video lesson, Michael Miller tells you why YouTube is so important — and why it should be part of your marketing mix. YouTube isn’t just for major advertisers; any business can benefit from marketing on the YouTube site. In this video lesson, Michael Miller shows you a variety of business, of all sizes and types, who are using YouTube as part of their marketing strategies. How can you use YouTube in your business? It’s not just about marketing — you can also use YouTube for customer support, employee communications, and recruitment. In this video lesson, Michael Miller describes the many different ways that companies are effectively using YouTube videos. How does YouTube fit in with all your other marketing activities? Is it part of your television advertising or social media marketing, or is it something more? In this video lesson, Michael Miller shows you how to add YouTube videos into your marketing mix — and make sure all your online marketing activities work together. What kinds of business videos are successful on YouTube? In this video lesson, Michael Miller describes the three types of effective YouTube videos — informative, educational, and entertaining. Before you produce your first YouTube video, you have to know what you’re doing, technology-wise. In this video lesson, Michael Miller walks you through the various file formats, resolutions, and aspect ratios that YouTube accepts — and tells you the best specifications for great-looking videos. There are three ways to produce a YouTube video — with a computer webcam, with a consumer camcorder, or using a professional video production service. In this video lesson, Michael Millers helps you determine which approach is best for your videos — and shows you how to produce the best-looking videos at the lowest possible cost. What do you need to produce a YouTube video? In this video lesson, Michael Miller recommends the best equipment to buy — from camcorders and video editing programs to tripods, lighting kits, and external microphones. Want to learn how to shoot a professional-looking YouTube video on a budget? In this lesson, Michael Miller shows you how to set up your equipment so that your videos look just like the ones produced by professionals. Video editing (what the pros call “post production”) can turn an average video into a great-looking one. In this video lesson, Michael Miller recommends the best video editing programs for your needs, and show you how to edit different scenes, add transitions and special effects, and add graphic and text overlays to your videos. How do you produce an effective informational video? In this video lesson, Michael Miller walks you through everything you need to know to create a great-looking “news” video — from composing the shot to adding onscreen text to making sure your video is fresh and up-to-date. How do you produce an effective how-to video? In this video lesson, Michael Miller walks you step-by-step through the steps of making a professional-looking instructional video — from the initial storyboard through the final editing. Entertaining videos are the most likely to go viral — but how do you make an entertaining video? There are no hard and fast rules, but in this video lesson, Michael Miller gives you his advice on how to be funny on YouTube. Once you’ve produced your video, you need to upload it to the YouTube site. In this video lesson, Michael Miller shows you step-by-step how to upload your YouTube videos — and provide the appropriate keywords and descriptions. Your YouTube channel is your home page on the YouTube site — and a terrific branding opportunity. In this video lesson, Michael Miller shows you how to create and customize your YouTube channel page — and upgrade to a full-featured Brand channel. How well are your YouTube videos performing? In this video lesson, Michael Miller walks you through the various Insight analytics that YouTube provides — and shows you how to track and analyze your videos’ performance. Most viewers find YouTube videos through search. As such, you need to optimize your videos for search. In this video lesson, Michael Miller shows you how to do SEO for YouTube videos — from choosing the right keywords to optimizing your video comments and ratings. YouTube lets you advertise your videos via the Promoted Videos PPC advertising program. In this video lesson, Michael Miller shows you how Promoted Videos work, how to create a PPC video ad, and how to link from your videos to your website using Call-to-Action Overlays. Do you want to make your YouTube videos more professional-looking and more effective? 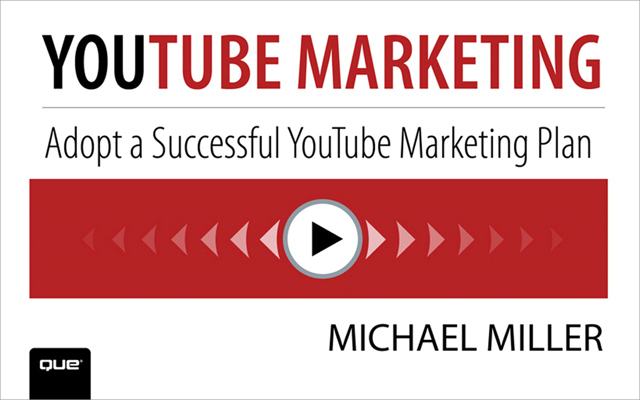 In this video lesson, Michael Miller shares his most powerful tips for achieving YouTube success — and boosting the performance of your entire online marketing plan. More than 3 hours of video to help marketers learn how to utilize YouTube as part of their marketing plans. YouTube Marketing includes 20 online video lessons that lead marketers through the steps necessary to adopt a successful YouTube marketing plan. They learn why YouTube is important to marketers, what types of businesses use YouTube, what types of videos are most successful, and how to shoot, edit, and upload those videos. Viewers also learn how to establish their own YouTube channels, how to promote their videos, and how to track their performance.